Wine as part of a healthy lifestyle is nothing new. 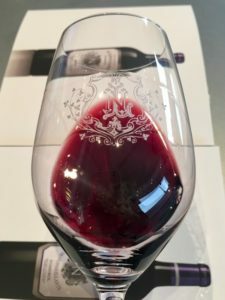 The debate around whether wine can be good for you or not continues to rage and I address a few of these questions in The Drinking Woman’s Diet. Another take on the wine and wellness debate is how the act of wine tasting can be good for you, as a meditative experience. Mindfulness is a buzzword of the wellness sector, so what about Winefullness? Quietening the mind is not easy, yes there are apps for that but what if you could harness your passion to help you? If you are reading this you are probably passionate about, or at least interested in wine and likely to have a glass of wine in front of you, some time soon. Observing the hue, intensity and density of a wine, the aromas of the bouquet and the taste and feeling on the palate can all be a meditative experience. Can tasting be a meditative experience? Can we adapt our basic tasting techniques, slowing it down to change the experience? Try this. – Start with the glass; take your glass of wine, as you pick it up by the stem think about the feel, the temperature and the texture of the glass between your fingers. – Bring the glass towards you. Look at the colour of the wine, the concentration or depth of the colour. – Bring the glass to the nose, inhale, exhale, pay attention to the aromas. – Swirl the wine around in the glass, look at the colours, how they change and reflect as the wine moves in the glass. This is another reason why tasting slows down your drinking, you need to keep your servings of a sensible size so the wine remains in the glass and not down your shirt! – Breathe the wine again, inhale, exhale – have the aromas changed? Are they different, or more concentrated? – Taste the wine. As you bring the wine into the mouth be aware of the taste, the texture, the temperature. Pay attention to the flavours on the palate – are they different to what the aromas lead you to expect? Do the flavours change? How long do they stay around for? What is the aftertaste, how long does it last? – As you swallow, sense the wine as it goes down the throat towards the stomach. Did your mind wander off? Try again. Bring your attention back to the glass for the second sip. Pause put the glass down, process all that before taking another sip. How is the second sip different from the first? All this takes time, which is a good thing, after all one of the tenets of healthy drinking is moderation and what better way of moderating your drinking than slowing the whole process down by paying attention to what you are drinking. The aim is to drink less but better and get more out of those allocated units. Yet another benefit of mindful drinking. This is something you can do in glorious isolation but it’s much more fun to do with a friend, or perhaps with a wine maker. 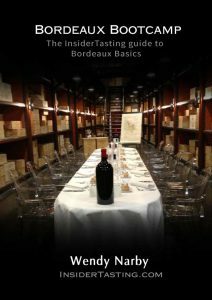 It’s an experience many chateaux in Bordeaux will be happy to share. Chateau visits always finish with a tasting where you are encouraged to compare and contrast the various wines of the property. Some vineyards are taking this notion of meditative tasting a step further welcoming guests with a greater emphasis on wine and wellness. 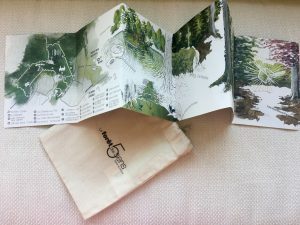 Here are a few of my favourites visits but I’d love to hear of others if you have some to share. Chateau Boutinet, not far from Saint Emilion, is a family run vineyard where they are keen to share their eco sensitive approach to viticulture but also to tasting. The visit to the vineyard, now under conversion to organic agriculture emphasises the unique bio diversity of the site. 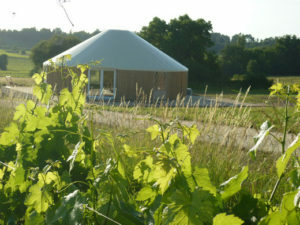 The tasting will take place in a yurt, hidden away in the vines but there is more than tasting happening here. Join them foran hour of yoga (all levels are welcome) in this unique eco friendly building. After 45 minutes of yoga poses and 15 minutes of mediation your mind, your palate and your chakras will be open to the tasting experience of the wine. 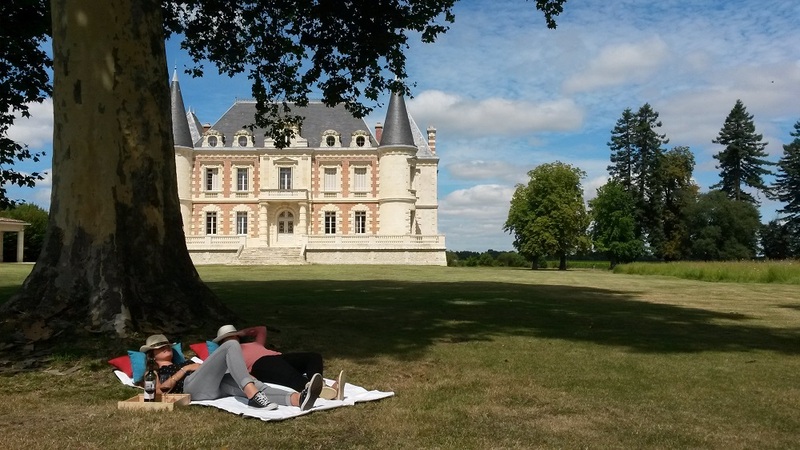 You could head south to Barsac, to Chateau Climens at the heart of Sweet white wine country. Here biodynamic producer Bérénice Lurton, harvests wild herbs to create the concoctions she uses for the treatment of her vines. 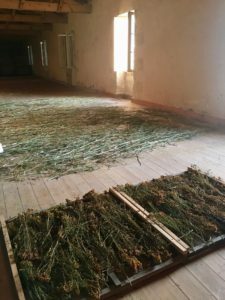 These are dried in the attic above the winery where you can experience a meditative yoga session, breathing in the aromas of the herbs preparing yourself for the tasting of the wines to follow. 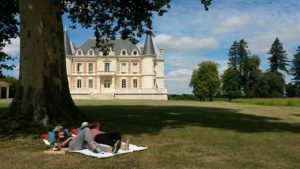 If relaxation is the key to improving your tasting skills, take this to another level with the Sophrology classes at Chateau du Payre. Available on certain Friday afternoons, they are the perfect end to the week and are followed by a tasting of course. Please don’t worry if you are too relaxed to leave afterwards, you can always stay in one of their charming guest rooms for the weekend. Or how about some forest bathing? Yes it’s a thing; strolling through nature to enjoy the sights, sounds and smells. I have already mentioned the ‘Land Art’ installation, The Forest of the Five Senses’ at Chateau Smith Haut Lafitte. 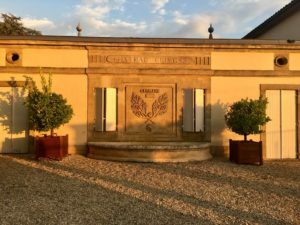 Hidden away in eight hectares of woods between Château Smith Haut Lafitte and neighbouring Château Le Thil, you will discover hidden artworks as well as the natural environment, their stealth cellar and of course it finishes with a tasting. 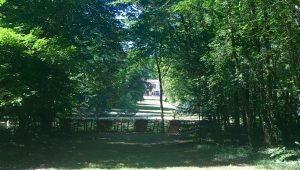 If all you want to do is just put your feet up, call in at Chateau Lamothe Bergeron, where you can relax in the shade of one of the century old trees in the park of the Chateau. Providing cushions and rugs, they encourage you to settle in and take your time to sip on your glass of wine. This experience is called the ‘Sieste de Bacchus’ so, should you nod off at the end of a long summer’s day, no one is going to come and disturb you – unless it’s to refill your glass! 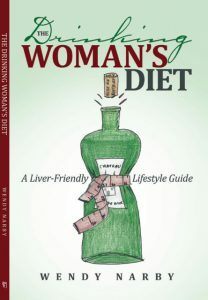 If you want to know more about wine and wellness buy a copy of ‘The Drinking Woman’s Diet’ here.